My favorite picture book as a child was Benjamin Dilley’s Thirsty Camel. Benjamin Dilley had a “wonderful imagination.” So wonderful he could dream up anything, including a thirsty camel to drink up the flood in his parent’s basement. The Storm by Akiko Miyakoshi. 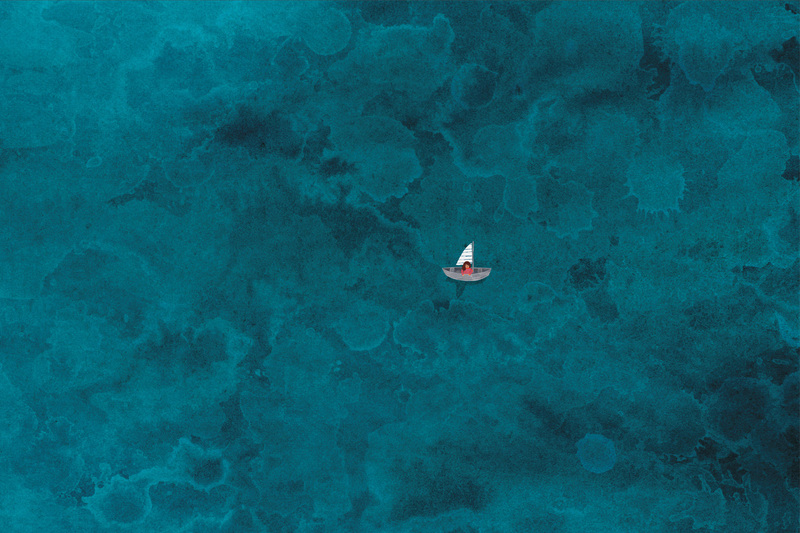 A child worries a storm will cancel a trip to the beach, so he makes a wish for a ship to drive the storm away. And in the morning after a fantastic dream—or wish come true—the sun shines again in this quietly captivating picture book. Akiko Miyakoshi is especially good at making the imaginative feel (or be) real, and the next book in this list is hers as well. 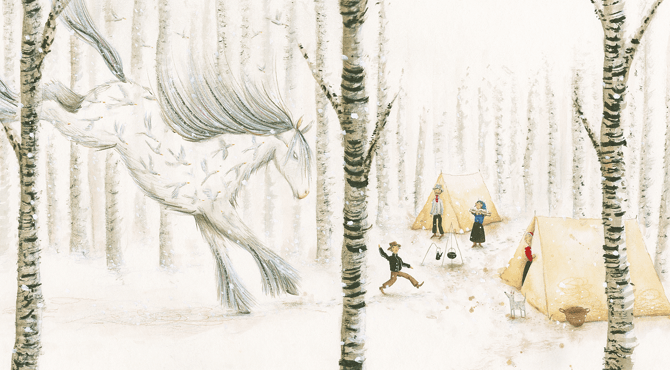 The Tea Party in the Woods by Akiko Miyakoshi. A girl walks through the woods to deliver a pie. It sounds like a set up for Little Red Riding Hood, but while there are surprises that await, there is no danger. A gentle fairy tale about a tea party with animals (and lots of pie), something a child might easily imagine and want to be as real as it feels in this story. A River by Marc Martin. “There is a river outside my window,” a girl says from her drawing table. She imagines herself traveling that river in a boat. Out of the city, through the fields, down a waterfall and into a jungle. 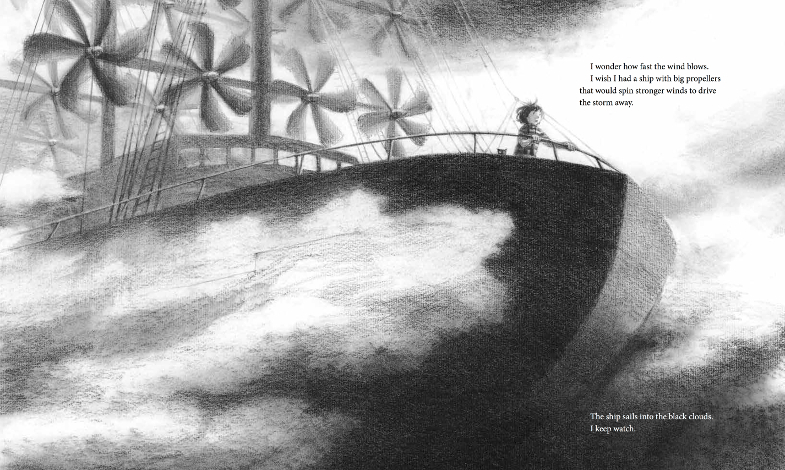 It is a wonderful voyage and the illustrations transport the reader right along with the character. Boat of Dreams by Rogério Coelho. This is a wordless and intriguing story. A man. A boy. Drawings sent across the ocean. A spectacular journey and a dream come true. Henry & Leo by Pamela Zagarenski. This gorgeous book demonstrates how real a favorite stuffed animal (friend) can feel, and goes so far as to make that real. Pamela Zagarenski always captures the stuff of childhood magic. 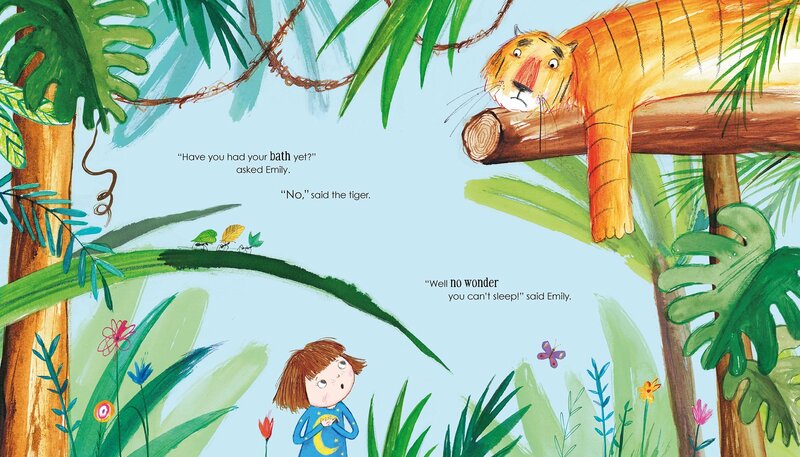 Good Night Tiger by Timothy Knapman, illustrated by Laura Hughes. Emma’s wallpaper has animals on it, and they’re making a lot of noise. So Emma enters the world of the wallpaper and helps the animals quiet down and go to sleep. Monster Trouble by Lane Fredrickson, illustrations by Michael Robertson. In this one, Winifred Schnitzel isn’t afraid of monsters, but they are ruining her sleep every night. So this fearless, creative main character figures out an inventive way to make them go away. This story assumes that the monsters are real, and why wouldn’t they be? Poppy Pickle by Emma Yartlett. One day, Poppy’s imagination comes to life. For real. And it gets her into a bit of a pickle. This one is pretty hilarious to boot. Poppy feels like a direct descendant of Benjamin Dilley, except that in the end, her parents do believe that the stuff she dreams up is real! Yes. 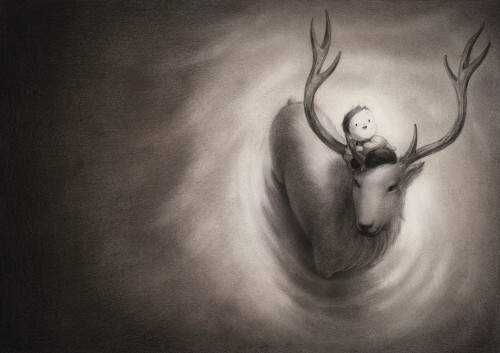 A lost child follows a stag into a magical world with kind animals and fluffy clouds, and is eventually delivered home. The expressive drawings in this wordless story make it feel that much more tangible. First Snow by Bomi Park. This book is enchanting! At first snowfall, a little girl sneaks outside to make a snowball. Her snowball gets bigger and bigger, and she travels farther and farther. Until! A whole field of little kids making snow people in their own magical world. Yokki and the Parno Gry by Richard O’Neill and Katharine Quarmby, illustrated by Marieke Nelissen. This is a traditional Romani tale. In a family of Travelers, a boy named Yokki tells stories every night around the fire. When times are tough for his and other families, he tells a story from his dreams of a Parno Gry, a giant horse who can carry them to a place where they can thrive. And that is exactly what happens. His story of the horse comes true. The Highest Mountain of Books in the World by Rocio Bonilla. Not only does the boy in this story, Lucas, learn that he can fly in a sense through story, he also builds the highest mountain of books in the world by doing so. And when he needs to come down, all it takes is his imagination, of course! Lenny & Lucy written by Philip C. Stead, illustrated by Erin E. Stead. A book about facing fear, and loneliness, and how to comfort both through friendship. 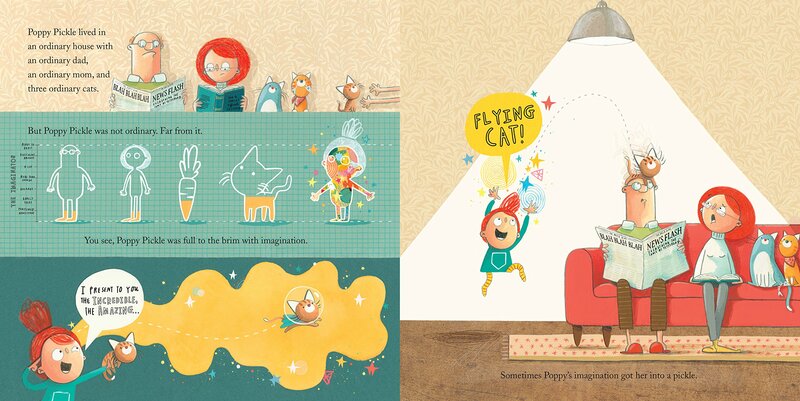 It’s the visual story in this one that shows Peter’s imagination coming to life. The image below and a wonderful feature of Lenny & Lucy can be found at the always wonderful site, Brain Pickings. In this stunner, two swimmers find a fantastic world of fish underneath the surface of a crowded pool. Whimsical and full of what might be. The Fox Wish by Kimiko Man, illustrated by Komako Sakai. Two children come upon a clearing of foxes playing with the jump rope they’d left there. Children and foxes jump rope together in this imaginative story of wishes and friendship. Never Follow a Dinosaur by Alex Latimer. A couple of kids follow footsteps, trying to piece together the mystery of who left them. They assume it’s a dinosaur. Readers might assume it’s not a dinosaur because dinosaurs are extinct. But in this case, well, let’s just say that all the facets of the footstep-leaving dinosaur these kids invent in their minds come true. Beyond the Pond by Joseph Kuefler. A pond becomes a portal to an exceptional world on the other side. 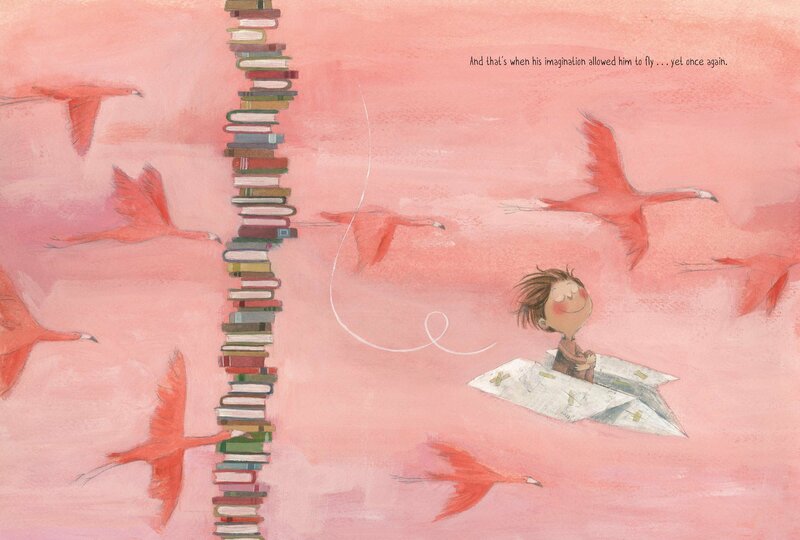 My friend Carter at Design of the Picture Book did a lovely interview with Joseph Kuefler. Please let me know in the comments if you have any books that make the imaginary feel real to add to the list! I’m not sure why, but the illustration styles/palettes of all of these books evoke a sense of nostalgia for me. It doesn’t seem like a single one was created digitally. Such a lovely feeling, one that makes me want to head to the library, gather them all in my arms, and then read each one slowly, in a lingering fashion. Perhaps with several pots of tea. That sounds like a perfect afternoon!!! Thanks for the recommendations! Monster Trouble and Goodnight Tiger remind me of Emily Brown and the Thing, which has both imaginary worlds and a little girl who isn’t afraid of the monster under the bed. I don’t know that one—I’ll have to look it up! Many thanks. Such beautiful recommendations! We have taken several of these out f the library before, but my daughter finds some of illustrations in the Tea Party in the Woods a bit scary, so I think she’s still a bit you (just turned 5). One of our favourites is Mr Tiger Goes Wild, I have a framed print of one of the scenes! Yay! 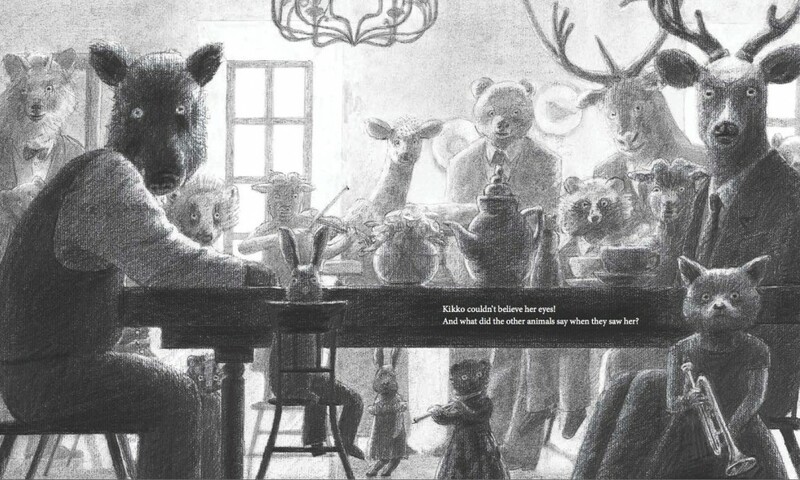 Oh, I guess that one could be a bit scary with all those animals staring out from the page—makes sense. I love her work so much. And Mr. Tiger Goes Wild is a new classic!